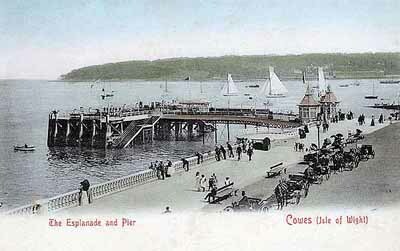 The Victoria Pier on Cowes Parade was opened in 1902 and was mainly used for pleasure steamers from other south coast resorts or as a stop for round the island cruises. A pavilion was added in the early years of operations. During WWI the cruises ceased but the pier was used by troops departing the island barracks or returning, often wounded servicemen on their way to Northwood House which was being used as a convalescent home. At the outbreak of WWII the pier was taken over by the Navy. As with so much other property commandeered for WWII, after the war the pier was found to be in need of significant structural repair, however, there were no funds available so the pier was left derelict. The pavilion was demolished in 1951 with the rest of the pier being removed by 1962.